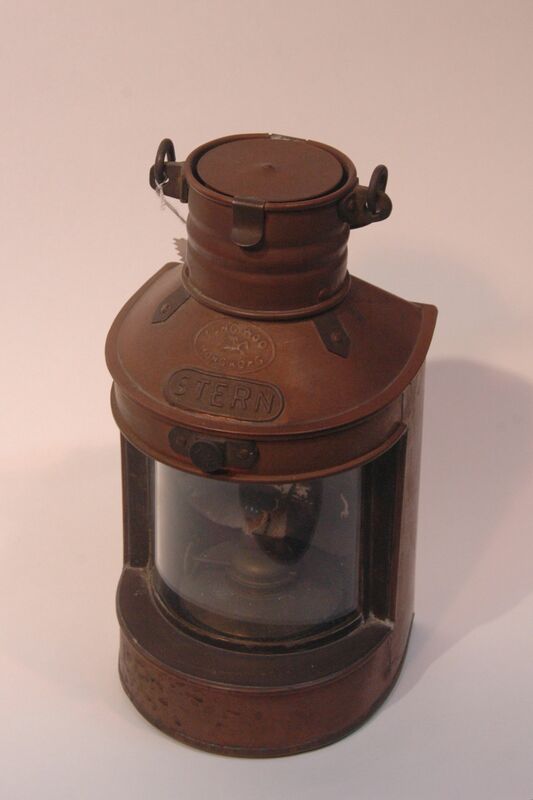 The oil lamp would have been as common an object at home as today’s light fixtures. Since its invention 2000 odd years ago, it had took on many forms, style and decorations. This particular one, would be a basic and utilitarian version. For those younger generations whom has not use an oil lamp before, the ceramic part should here acted as a stand, a small metal dish topped with tung oil would be placed on the top of the stand. A wick will be tipped into the oil with one end placed at the edge of the dish to be lighted up. Click to see our other traditional lighting. 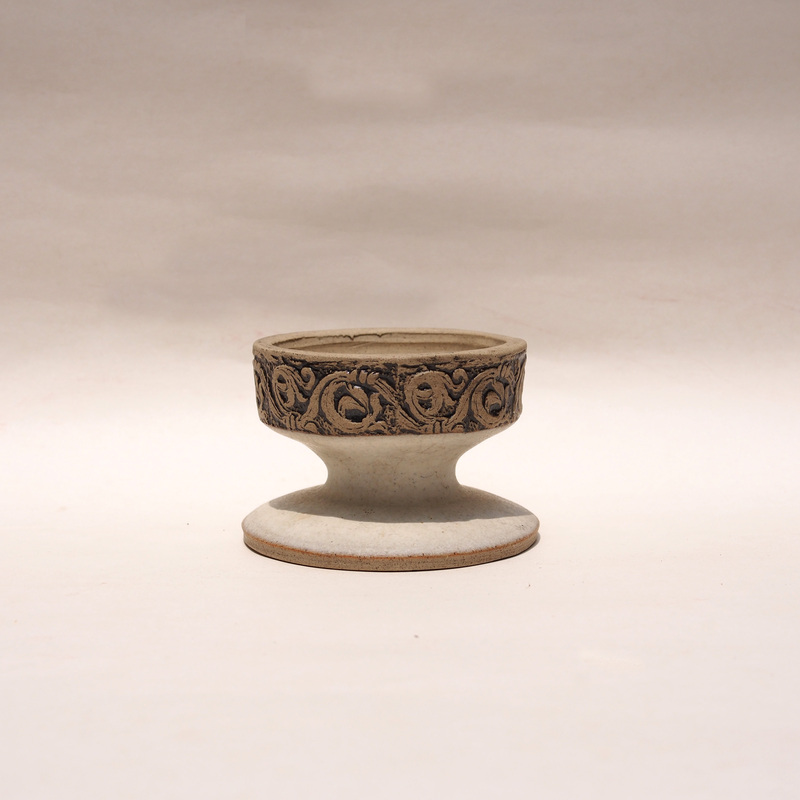 A stoneware candle holder with engraved pattern. It is believed that the first court lantern was made for Emperor Liu Xiu, 23 A.D., after successfully unifying the country he held a large banquet in the palace, decorated with ribbons and lanterns. Until the Sui dynasty, the court lantern is restricted for the use in the palace. On the coronation of Emperor Wen, 590 A.D., the city Lou Yang held a bit celebration with nightly banquets, operas and court lanterns hanging throughout. Since then, on the day of Yuan Xiao every family will hang up court lanterns on the main beam of the living room. This is the wooden frame of the lantern, a decorative silk or glass panels. The frame can be folded up nicely for storage till the next Yuan Xiao festival. A figurine of a boy dressed in a du dou, a long life locklet and lifting a bowl on top of him. The bowl is the oil container for the oil lamp while the boy being the stand. The name of the lamp, “Boy Raising A Lamp” (童子舉燈) signified however, the lamp is referring only to the container itself. This is a popular theme for Chinese oil lamp, of different material and for pottery different kilns. 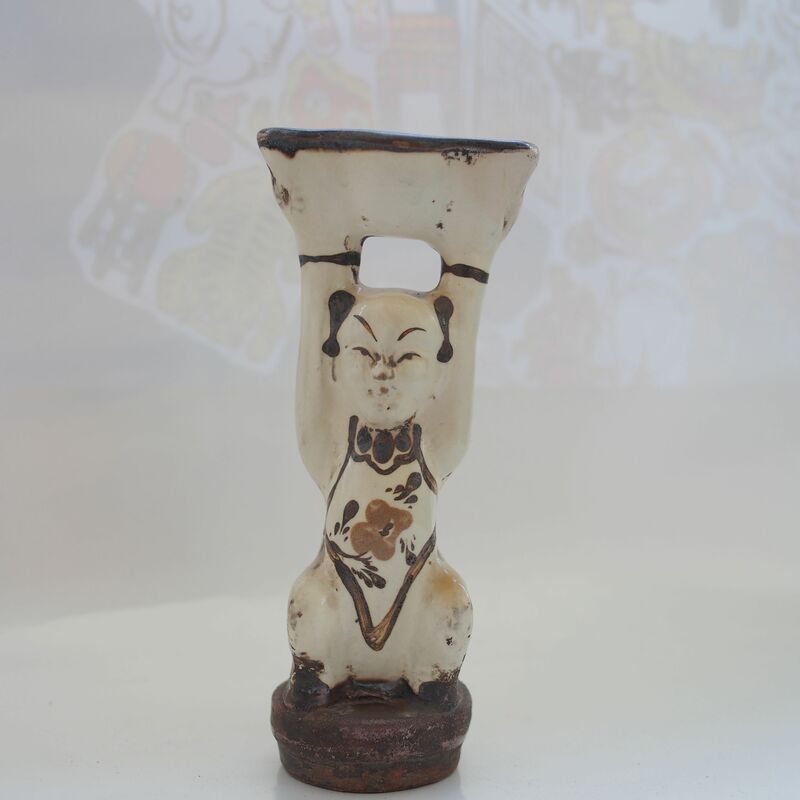 This figurine is an example of the Ci Zhou kiln. The name 童子舉燈 “Tong Zi Ju Deng” is taken as a blessing for the child of the family, the first three words 童子舉 is a name for a official tang dynasty exam for the gifted child of under 10 years of age, while the word 燈 “deng” is a homonym to the word 登”deng” meaning ascend, achieved. The oil lamp has been a form of lighting since the Warring State period (400BC), with its long history the design explored into many different forms and materials, by the Ming and Qing dynasty they are as common as today’s light bulb. Lamps for the court and the wealthy tend to be decorative, the one used by the folks are more functional based (see our previous entries; oil lamp, pewter oil lamp, oil lamp shades). They remained as a form of lighting till the arrival of the gas lamp from the west and of course electricity, my parents still remember the days when they are reading under the light of an oil lamp when they were a child. 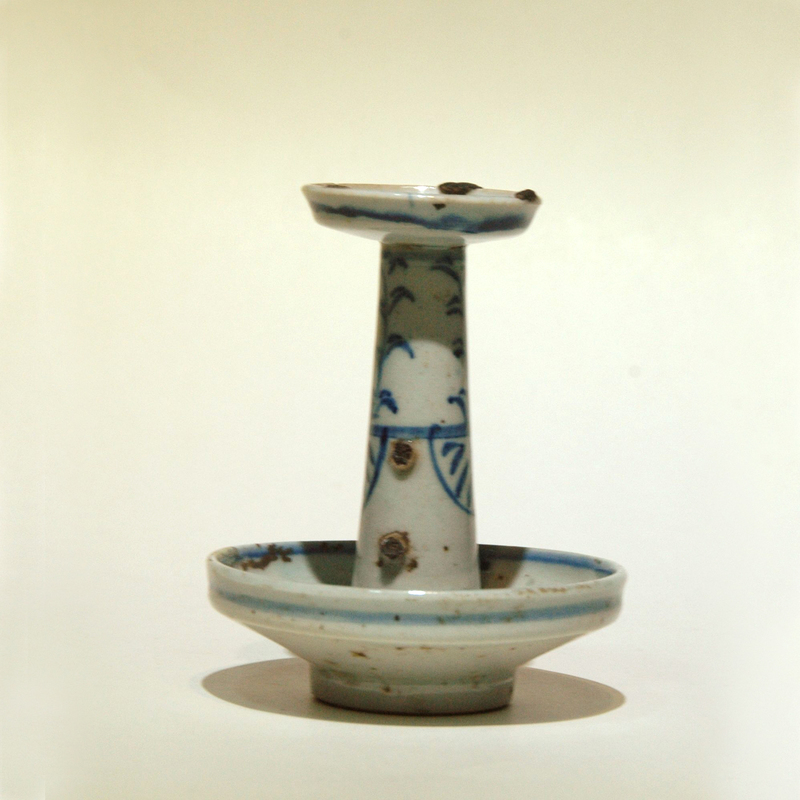 This is a traditional Chinese white glaze candle stand, this can be seen by the small hole on center of the top dish. The traditional candle has a bamboo stick attached to the bottom, the candle would be secured by inserting it into the small hole. 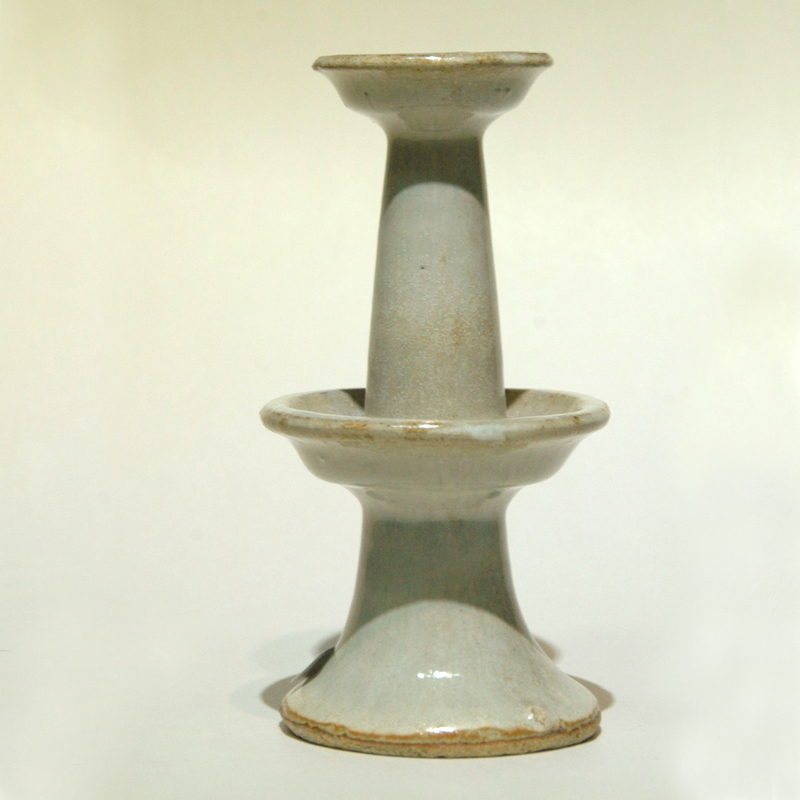 Candle stands have been around since the 3 Kingdoms period (210AD) until the Tang dynasty they have been more descriptive and elaborated capturing the shape an animal or a plant, etc. From the Sung dynasty, the form became more utilitarian and the 2 level form are the most common. Talking about candles, I would like to share with you the candles hand made and designed by my friend Maha Alusi in Berlin. And of course her view on “Passing Moments”. 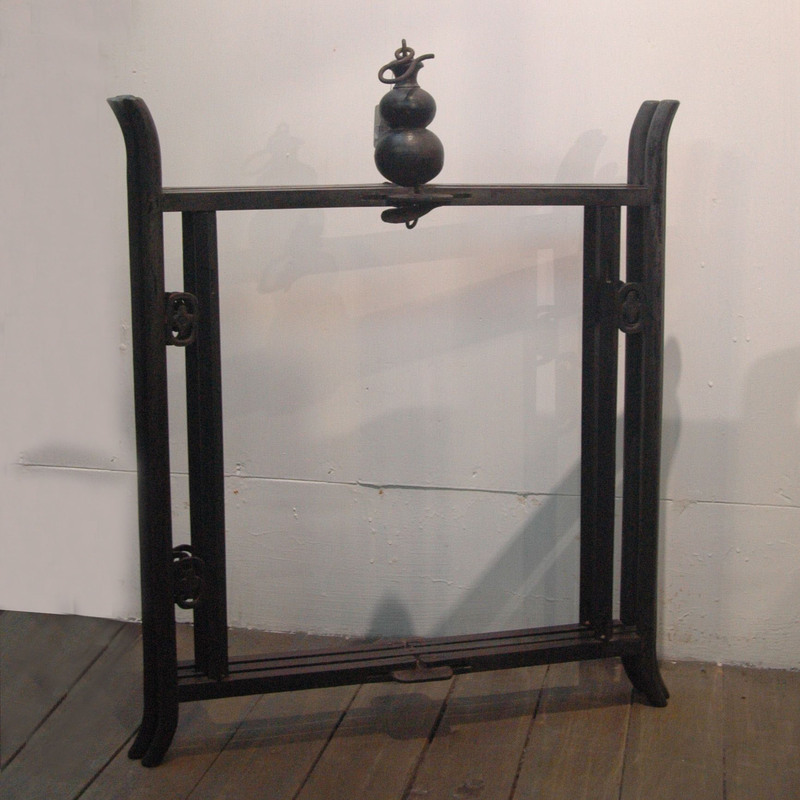 This is a pair of wooden candle stand that would have been mounted on a metal or wooden base, the candle would be fixed on top of the wooden stick. Traditional Chinese candles besides having a wick embedded, a small bamboo rod is also embedded on the bottom end. The bamboo rod made it easier for securing the candle, may it be on a candle stand, in the sand or simply in the ground. 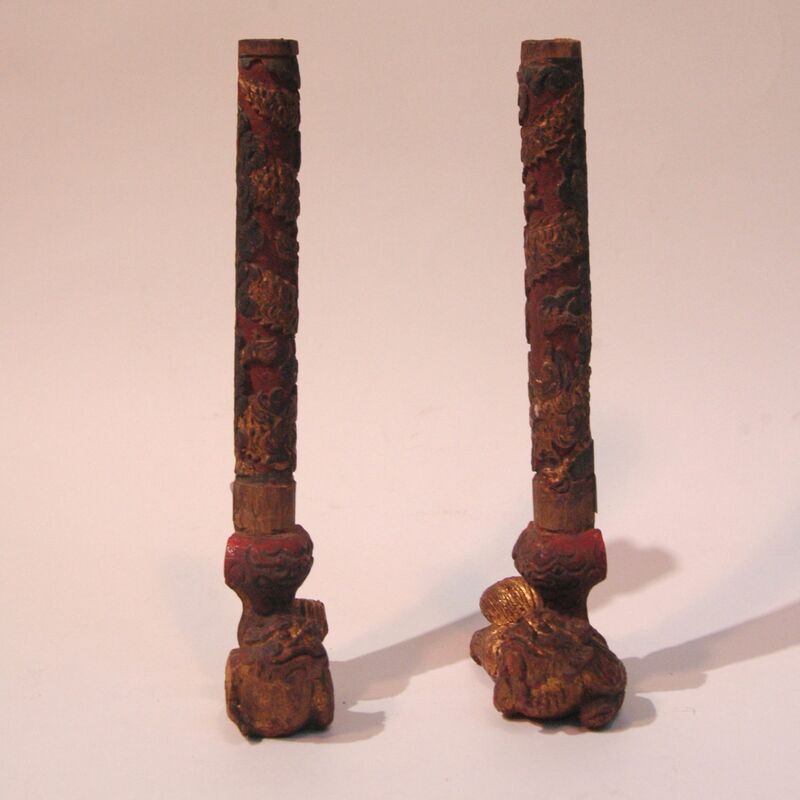 This pair of candle stand has a relief carving of the dragon, painted in red and gold, symbolizing blessings, they would have been used for happy occasions like grand birthdays, promotions, birth of a child, etc. 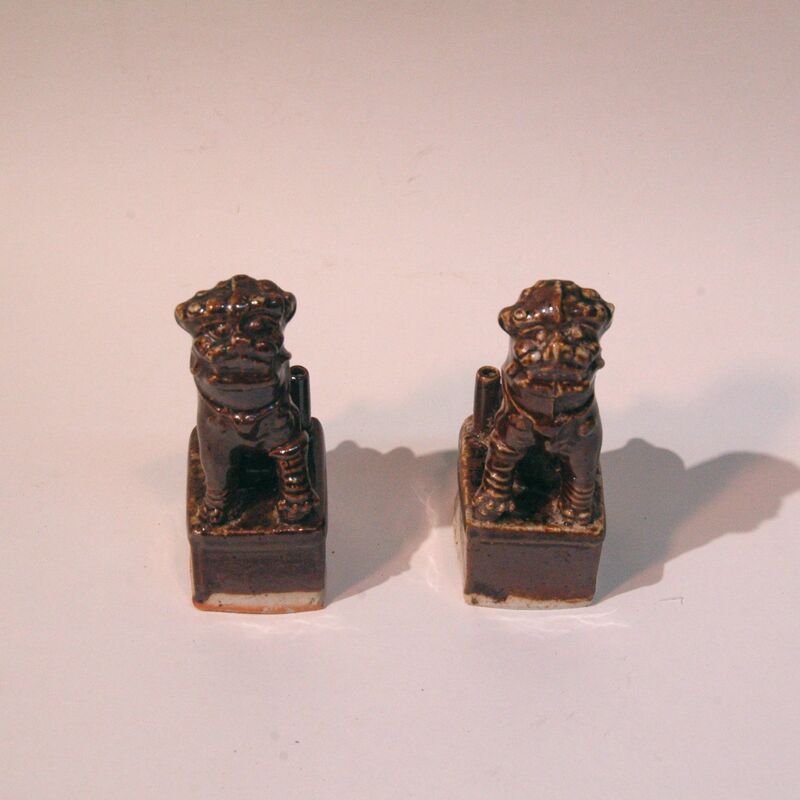 This is a pair of brown glazed candle stand with a lion figurine. 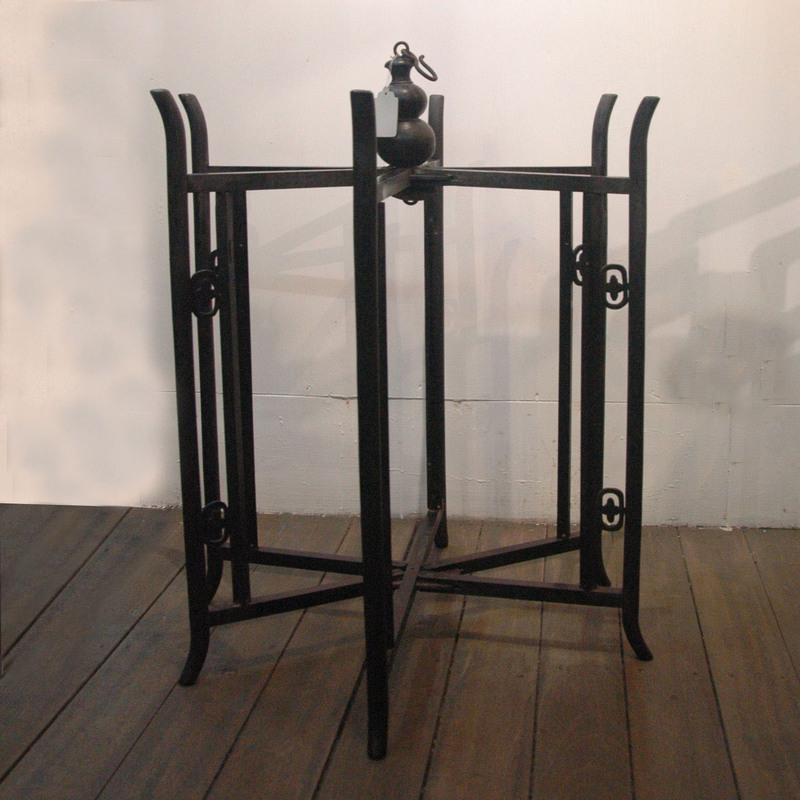 The lion style candle stand has been popular since the Jin dynasty (at that time the lion is more chubby and the candle holder is attached to the figurine itself). The Chinese believe that the lion is the king of the animals and thus can offer protection, aside from the other animals also from evils. This is a small marine masthead navigation light which uses an oil lamp. It is made by an old Hong Kong marine light company called Tung Woo which unfortunate is no long in business. 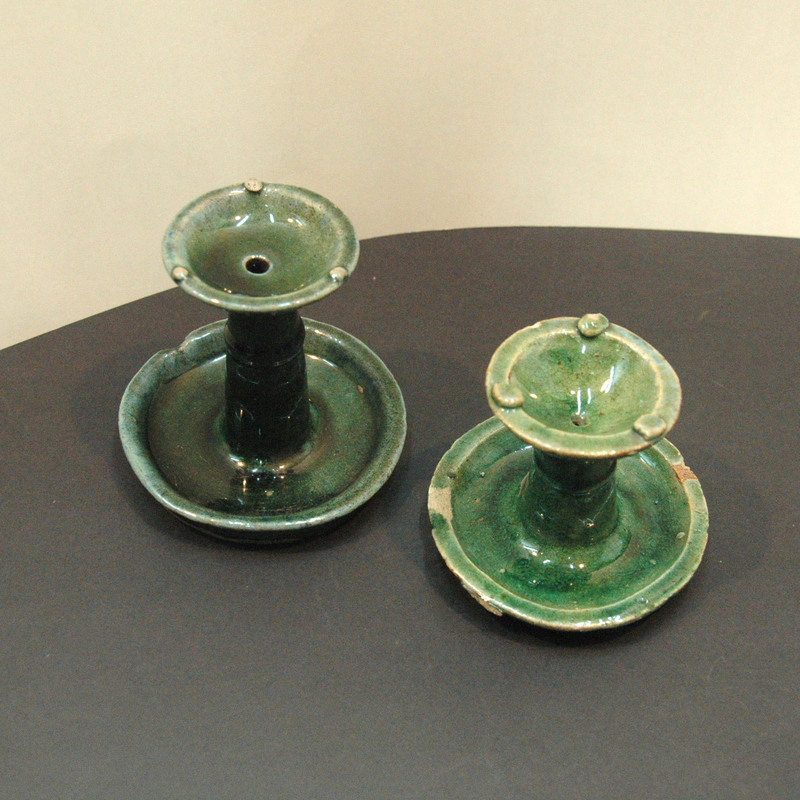 We have a collection of these green glazed oil lamps, in pairs, of different heights. 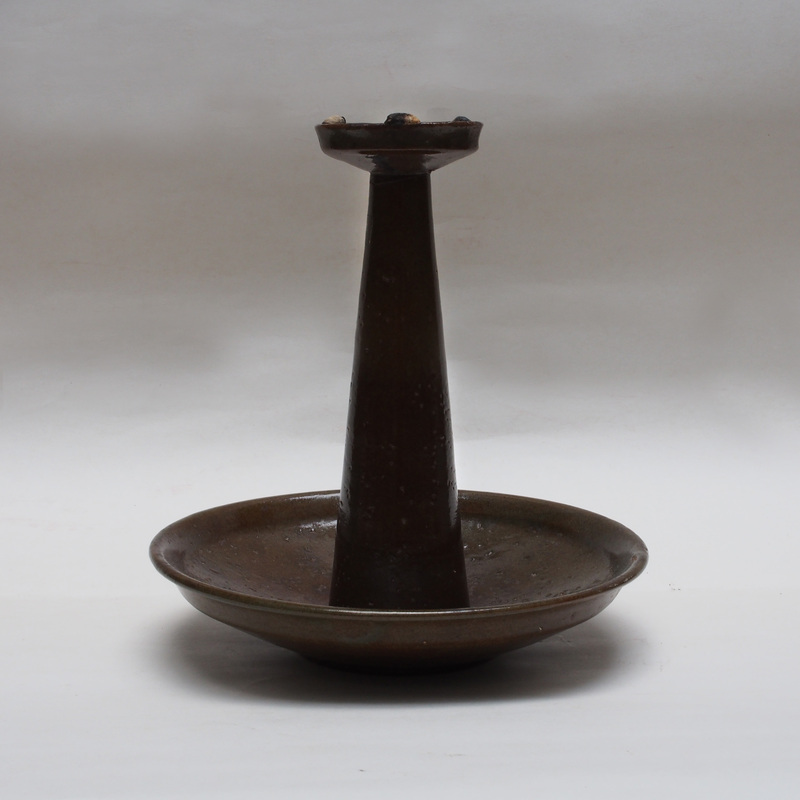 For the ceramic oil lamp design, the design for these lamps are the most basic. Its functional, well proportioned and durable (if Muji existed in Qing dynasty China, I suspect their oil lamp will be like these). They are made on a pottery wheel and glazed with green glaze that has been popular since the Sung dynasty.